Looking back in time nearly 9 billion years, an international team of astronomers found mature galaxies in a young universe. The galaxies are members of a cluster of galaxies that existed when the universe was only 5 billion years old, or about 35 percent of its present age. This compelling evidence that galaxies must have started forming just after the big bang was bolstered by observations made by the same team of astronomers when they peered even farther back in time. The team found embryonic galaxies a mere 1.5 billion years after the birth of the cosmos, or 10 percent of the universe's present age. The "baby galaxies" reside in a still-developing cluster, the most distant proto-cluster ever found. 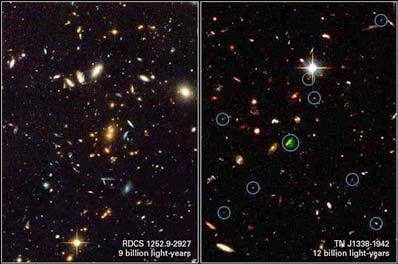 The Advanced Camera for Surveys (ACS) aboard NASA's Hubble Space Telescope was used to make observations of the massive cluster, RDCS 1252.9-2927, and the proto-cluster, TN J1338-1942. Observations by NASA's Chandra X-ray Observatory yielded the mass and heavy element content of RDCS 1252, the most massive known cluster for that epoch. These observations are part of a coordinated effort by the ACS science team to track the formation and evolution of clusters of galaxies over a broad range of cosmic time. The ACS was built especially for studies of such distant objects. These findings further support observations and theories that galaxies formed relatively early in the history of the cosmos. The existence of such massive clusters in the early universe agrees with a cosmological model wherein clusters form from the merger of many sub-clusters in a universe dominated by cold dark matter. The precise nature of cold dark matter, however, is still not known. The first Hubble study estimated that galaxies in RDCS 1252 formed the bulk of their stars more than 11 billion years ago (at redshifts greater than 3). The results were published in the Oct. 20, 2003 issue of the Astrophysical Journal. The paper's lead author is John Blakeslee of the Johns Hopkins University in Baltimore, Md. The second Hubble study uncovered, for the first time, a proto-cluster of "infant galaxies" that existed more than 12 billion years ago (at redshift 4.1). These galaxies are so young that astronomers can still see a flurry of stars forming within them. The galaxies are grouped around one large galaxy. These results will be published in the Jan. 1, 2004 issue of Nature. The paper's lead author is George Miley of Leiden Observatory in the Netherlands. "Until recently people didn't think that clusters existed when the universe was only about 5 billion years old," Blakeslee explained. "Even if there were such clusters," Miley added, "until recently astronomers thought it was almost impossible to find clusters that existed 8 billion years ago. In fact, no one really knew when clustering began. Now we can witness it." Both studies led the astronomers to conclude that these systems are the progenitors of the galaxy clusters seen today. "The cluster RDCS 1252 looks like a present-day cluster," said Marc Postman of the Space Telescope Science Institute in Baltimore, Md., and co-author of both research papers. "In fact, if you were to put it next to a present-day cluster, you wouldn't know which is which." How can galaxies grow so fast after the big bang? "It is a case of the rich getting richer," Blakeslee said. "These clusters grew quickly because they are located in very dense regions, so there is enough material to build up the member galaxies very fast." This idea is strengthened by X-ray observations of the massive cluster RDCS 1252. Chandra and the European Space Agency's XMM-Newton provided astronomers with the most accurate measurements to date of the properties of an enormous cloud of hot gas that pervades the massive cluster. This 160-million-degree Fahrenheit (70-million-degree Celsius) gas is a reservoir of most of the heavy elements in the cluster and an accurate tracer of its total mass. A paper by Piero Rosati of the European Southern Observatory (ESO) and colleagues that presents the X-ray observations of RDCS 1252 will be published in January 2004 in the Astronomical Journal. "Chandra's sharp vision resolved the shape of the hot gas halo and showed that RDCS 1252 is very mature for its age," said Rosati, who discovered the cluster with the ROSAT X-ray telescope. RDCS 1252 may contain many thousands of galaxies. Most of these galaxies, however, are too faint to detect. But the powerful "eyes" of the ACS pinpointed several hundred of them. Observations using ESO's Very Large Telescope (VLT) provided a precise measurement of the distance to the cluster. The ACS enabled the researchers to accurately determine the shapes and colors of the 100 galaxies, providing information on the ages of the stars residing in them. The ACS team estimated that most of the stars in the cluster were already formed when the universe was about 2 billion years old. X-ray observations, furthermore, showed that 5 billion years after the big bang the surrounding hot gas had been enriched with heavy elements from these stars and had been swept away from the galaxies. If most of the galaxies in RDCS 1252 have reached maturity and are settling into a quiet adulthood, the forming galaxies in the distant proto-cluster are in their energetic, unruly youth. The proto-cluster TN J1338 contains a massive embryonic galaxy surrounded by smaller developing galaxies, which look like dots in the Hubble image. The dominant galaxy is producing spectacular radio-emitting jets, fueled by a supermassive black hole deep within the galaxy's nucleus. Interaction between these jets and the gas can stimulate a torrent of star birth. The energetic radio galaxy's discovery by radio telescopes prompted astronomers to hunt for the smaller galaxies that make up the bulk of the cluster. "Massive clusters are the cities of the universe, and the radio galaxies within them are the smokestacks we can use for finding them when they are just beginning to form," Miley said. The two findings underscore the power of combining observations from many different telescopes that provided views of the distant universe in a range of wavelengths. Hubble's advanced camera provided critical information on the structure of both distant galaxy clusters. Chandra's and XMM-Newton's X-ray vision furnished the essential measurements of the primordial gas in which the galaxies in RDCS 1252 are embedded, and accurate estimates of the total mass contained within that cluster. Large ground-based telescopes, like the VLT, provided precise measurements of the distance of both clusters as well as the chemical composition of the galaxies in them. The ACS team is conducting further observations of distant clusters to solidify our understanding of how these young clusters and their galaxies evolve into the shape of things seen today. Their planned observations include using near-infrared observations to analyze the star-formation rates in some of the target clusters, including RDCS 1252, to measure the cosmic history of star formation in these massive structures. The team is also searching the regions around several ultra-distant radio galaxies for additional examples of proto-clusters. The team's ultimate scientific goal is to establish a complete picture of cluster evolution beginning with the formation at the earliest epochs and detailing the evolution up to today.